David Sengel and I were college roommates and I can attest to his talent for making art out of almost anything. 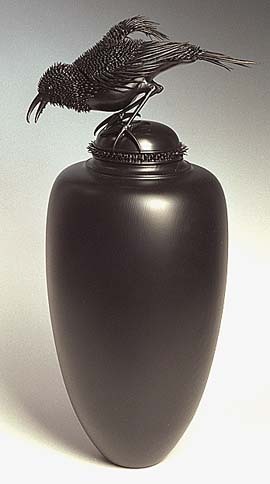 Now his extraordinary work is in museum collections from the Smithsonian to Honolulu. 35 years ago David moved up to the North Carolina Blue Ridge, first Blowing Rock and then Boone. He perfected his craft as a woodturner, using woods on his land: black walnut, laurel root, hazelnut husks, box elder and most unusually, honey locust thorns. David has the sensibility of an artist living on a high ridge with wild weather; no mild valley for him. After a while I started seeing his name on lists of contemporary “masters.” He also learned to play banjo–and married his banjo teacher. Last week was hard at Fog Likely Farm. Lily Dog was lethargic and not eating for a couple of days so I took her to the vet. She was anemic, which is often a sign of something more serious. She just faded away peacefully a couple of nights later. That was the first time I had chosen to stick with an animal to the end instead of letting the vet do it, and though emotionally wrenching, it was the right choice. I would covet that easy a death for anyone. So we are left with a solo rock chasing dog. Bela, the sister, seems in good health for her age, almost 15. It is yet to be determined how she will fare without her running mate and alpha sister. Our friend Mathew had just about finished fencing in a couple of acres and building a stall onto our barn so he could bring his horse and hinny up here. His father sold an airplane he had, bought a 35 acre farm in North Georgia, and now Mathew is headed back south. What shall we get? Pony? Goats? Leaning towards giraffes myself. David and his wife Susie Winters grow stuff year-round and are mainstays of the farmer’s market in Boone. Last year, he built a substantial greenhouse. February was 3 degrees milder than normal, but the next two months are always a roller coaster here. So many frogs croaking in the ponds today it sounds like a gaggle of geese. I am still impressed that they see you walking from as much as 40 feet away and shut up. David also serves on the Watauga County Farmers’ Market Board. At issue last week: the membership eligibility of a local non-profit. David was fighting for their inclusion. Putting on the gloves to go to yet another farmers market board meeting. Didn’t get much sleep last night after dueling emails all afternoon. Hopefully some resolution today but a sneaky Louisiana lawyer is an exhausting fight. 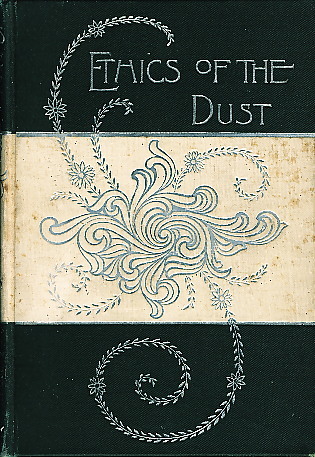 Ethics of the Dust is the title of an interesting little book I found in the house on Carvin’s Cove Road years ago. I think I still have it. I took the gloves off at the board meeting Friday and ground the opposition into dust. Had to use Roberts Rules to get my topic on the agenda after the pres said it wouldn’t be. He doesn’t lose gracefully, but no blood was shed. The aftershocks no doubt will be interesting however. I did actually sleep well that night. Small victories sometimes have you looking for larger ones? “Renwick Gallery’s ‘A Revolution in Wood’ reveals a medium transformed” (The Washington Post, October 8, 2010). 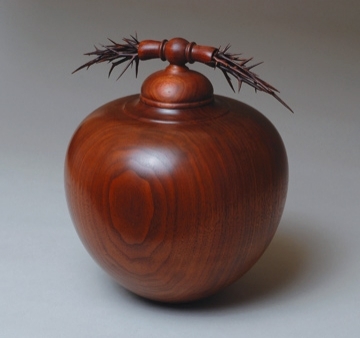 This entry was posted in Climate change + Culture, Deep Ecology, John Wackman blog and tagged Boone North Carolina, David Sengel, del Mano Gallery Los Angeles, Ethics of the Dust John Ruskin, Watauga County Farmer's Market, wood art, wood sculpture, woodturning. Bookmark the permalink. Recently I wrote a blog entry offering a leftist critique of the ideology of “Green” environmentalism, deep ecology, eco-feminism, and lifestyle politics in general (veganism, “dumpster diving,” “buying organic,” “locavorism,” etc.). I’d be interested to hear your thoughts on the matter and any responses you might have to its criticisms. Why I wept upon reading this I am not sure. I have thought of David over the years and wondered where he went. I always thought of him as a blonde and bearded wizard, w/ his spoon making and piano tuning tools. What amazing art he is living and making! My eldest sister lives in Boone. I am thrilled to know what he is about in this world. Thank you for sharing. When you speak to David next , send my love and blessings his way.